My favorite Marilyn Monroe movie is “Some Like it Hot.” If you haven’t seen it, she plays Sugar Kane, the lead singer of an all-girl jazz band who has a weakness for falling in love with saxophone players. In the movie, she’s adorable and funny and heartbreaking as the girl who “always gets the fuzzy end of the lollipop.” It’s the epitome of the characters she was known for playing. Beautiful, helpless, not so smart. Unfortunately, that has become not just the roles she played, but her legend. 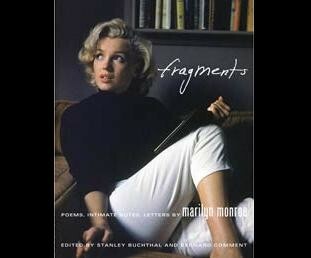 But did you know that MM often insisted on having her photograph taken whilst reading books? Did you also know that she took night classes in literature at UCLA in her spare time? She also scribbled poems and little notes to herself in a variety of notebooks. This wonderful book collects many of those. This book, edited by Stanley Buchthal and Bernard Comment, places side-by-side her actual writing and transcriptions of them. Often her stream-of-consciousness writing jumps all over the page and only gives a small insight to what was really going on inside her mind. They have also collected a variety of pictures of MM with authors and artists whom she admired. To me, this book is vital in understanding her. It is also vital in understanding that people are not always the image they present. We never know what’s stirring in someone’s mind. Marilyn Monroe was no exception. It makes me so happy that we can finally put a little of this “dumb blonde” nonsense away and respect her for the complete human being she was.